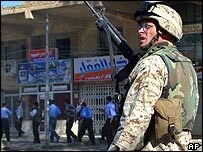 Polish troops in Iraq have handed over military authority in two provinces to US marines because of worsening security in the holy city of Najaf. The move came amid renewed fighting in Najaf as Iraqi and US forces battled supporters of Shia cleric Moqtada Sadr. The cleric rejected an appeal for his men to leave, saying he would defend Najaf with his last drop of blood. The BBC's Alastair Leithead in Baghdad says the new interim government is facing its first big test. The news that the Polish-led multinational force was giving up control of Najaf and Qadisiya provinces came in a Polish military statement. The change was ordered by the senior US officer in Iraq, Gen George Casey, the statement said. It added that the Americans would not be subject to the multinational mandate, which does not allow combat operations. The multinational force retains control of three other provinces in the area. Six Iraqis died in a car bomb explosion near Baquba, about 40 miles (70km) northeast of the capital, Baghdad. The apparent target was Aqil Hamid al-Adili, deputy governor of the Diyala province, who was wounded and is being treated in hospital. Shortly after the announcement, Polish Prime Minister Marek Belka met US President George W Bush for scheduled talks at the White House in Washington. Mr Bush praised the role played by Polish troops in Iraq, but Mr Belka said no-one wanted to stay in Iraq forever, although he added that the two men had not talked about specific timings. The BBC's Dan Griffiths in Washington says the situation in Iraq is putting a strain on the traditionally strong relationship between the US and Poland. Our correspondent says US marines have been in nominal control of the Najaf area since Spain withdrew its troops after a change of government in March, and the handover by Polish troops confirms that position. 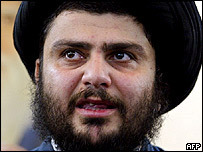 Earlier, Mr Sadr rejected Iraqi government calls for his men to leave Najaf and vowed to defend the city. "I will stay in holy Najaf and will not leave it," he told a news conference. "I will stay here in defence of holy Najaf because it is the holiest city and I will stay there until the last drop of my blood." The cleric rejected efforts to negotiate a truce while fighting continued, saying: "The holiest city is being bombarded and then they want to hold negotiations. "Occupation and freedom cannot exist at the same time - negotiations and bombing cannot take place at the same time." Artillery and tank fire rocked the city in the latest clashes. The fighting erupted in Najaf on Thursday, when members of Mr Sadr's militia - known as the "Mehdi Army" - clashed with Iraqi police and governor Adnan al-Zorfi requested American support. The violence broke a ceasefire agreed in June. The number of casualties in Najaf is unclear. An unnamed US military official told Reuters news agency that 360 militants had been killed - but Mr Sadr's militia has said its losses are much lower. On Monday, the UK defence ministry said one British soldier had been killed in clashes with militiamen loyal to Mr Sadr on the streets of Basra. A UK military spokesman said the situation in Iraq's second city was "extremely tense" after the clashes, in which two vehicles were destroyed. Also on Monday, the Iraqi interior ministry announced a curfew for 16 hours every day in Sadr City, the mainly Shia area of Baghdad that has seen daily clashes between US-led forces and supporters of Mr Sadr. The curfew will run until further notice from 1600 every afternoon until 0800 the next morning. "One British soldier has been killed in the clashes"